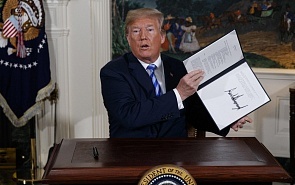 On May 8, US President Donald Trump announced his decision to withdraw from the 2015 multilateral accord seen as a crucial step towards eliminating the potential threat from Iran’s nuclear programme and normalizing the country’s relations with the West. In a televised speech, Trump called the deal “a horrible, one-sided deal that should have never, ever been made,” and reiterated longstanding claims that Iran harbors ambitions to build nuclear weapons. According to Valdai Club expert Hamidreza Azizi, Assistant Professor at the Tehran-based Shahid Beheshti University, the most important part in Trump’s speech was a clear shift towards regime change in the United States’ Iran policy. “As he talks about the necessity to reach a broader deal with Iran, he tries to separate the Iranian people from the Iranian government,” Azizi said in an interview with valdaiclub.com on Tuesday. “When you do this, it will not be possible to negotiate with a government that you do not regard as representative of its people,” he added. Trump’s speech was not about the nuclear issue in itself, Azizi believes. Trump was talking about Iran as a threat in the region and clearly demonstrated that the United States would try to change the direction of Iran’s behavior in any possible way. Concerning the sanctions, their resumption on the United States’ part was not something unpredictable for Iran, Azizi stressed. However, given the current economic situation, especially the fall in the value of Iran’s currency in the recent months, the new wave of US sanctions can have an undeniable impact on Iran’s economy. But the situation is not as bad as it was before the Iran deal was struck in 2015, he believes. “If you compare the current situation to that before the nuclear deal, in 2012-2015, it was also a period of sanctions of the United Nations Security Council and Europe. In other words, at that time Iran faced a comprehensive set of sanctions”, Azizi said. “So the real impact of the US sanctions on the Iranian economy will depend on the reaction of its European partners. If they are ready to continue their cooperation with Iran, it will have less consequences on the Iranian economy.” Therefore Iran will be focused on negotiating with other parties to the deal, he concluded. Following Trump’s speech, Iranian President Hassan Rouhani said that his government remained committed to the nuclear deal with world powers, despite the United States’ decision to withdraw from it, but was also ready to step up its uranium enrichment programme.